The bears have embraced the final speech of the year from their best friend, Federal Reserve Chairman Jerome Powell. And that could lead to a fresh wave of selling. The former partner at The Carlyle Group strode to an altar in front of reporters on Wednesday in DC and shrugged off the stock market’s two-month plus beating, slowing global economic growth and the ongoing verbal lashing from the guy who hired him (president Trump). Mr. Market quickly showed what it thought of Powell’s performance. The Dow Jones Industrial Average tanked 352 points to its lowest level of the year. “Regardless, markets were looking for more signals from Chair Powell that he hears their concerns. He is now in a tough spot,” said Datatrek co-founder Nicholas Colas. SunTrust Chief Markets Strategist Keith Lerner told Yahoo Finance there is a “buyer’s strike” in the market right now. Oof. The average investor is probably wondering how one person — albeit one powerful person — managed to send stocks into a fresh tizzy within an hour. 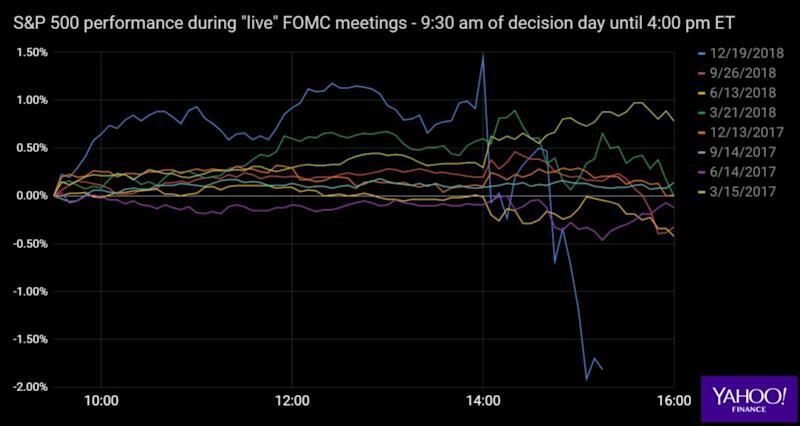 It’s not enough to say “Powell jacked up interest rates again, the market hates higher rates.” Per the usual on Fed decision days, there is a good deal of psychology at play. A single word could upset investors, which was obviously the case on Wednesday. Yahoo Finance compiled a checklist for the average investor to use to help understand what Powell just did and why the market responded so harshly. Feeding recession fears: The Fed forecast two years of slowing GDP growth in its economic projection materials. GDP is expected to take a step down to 2.3% in 2019 from 3% this year. That’s a downgrade of the Fed’s September protection for 2019 of 2.5% growth. For those increasingly worried about a U.S. recession next year, the downgrade only feeds the concerns. Not helping matters is Powell saying there is a “mood of angst” amongst businesses he speaks with on the economy. Missing inflation: The Fed forecast 1.9% inflation in 2019 as measured by their preferred personal consumption expenditure (PCE) gauge, down from 2% previously. That is also below the Fed’s long-term goal of 2%. Powell downplayed the ongoing undershoot of the target. “Well, we’re pretty close to 2%,” Powell told reporters. Bottom line: if the economy was as healthy as Powell suggests, there would be more inflation and the Fed wouldn’t have downgraded its outlook. The psychological: The market has a long held view the Federal Reserve closely watches the stock market and gets worried when it declines. And when they get worried, the Fed will be more inclined to be dovish with their policy. Powell stuck a fork in that view on Wednesday, which likely spooked some investors. The Fed chair downplayed the market’s slide since October and said it wasn’t much a factor in the monetary policy body’s decision. How investors read that: The market could keep declining into 2019 and the Powell led Fed will continue to hike interest rates. Nobody on Wall Street is keen on that prospect. The balance sheet: Powell also suggested the Fed will continue to wind down its $4 trillion balance sheet. The process, which is running at a $50 billion a month clip, is seen on Wall Street as leading to tighter financial conditions. In other words, less friendly conditions for stocks. "I think that the runoff of the balance sheet has been smooth and has served its purpose," Powell said during the conference. "I don't see us changing that."